This is a Goan breakfast dish. 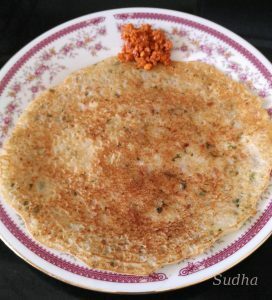 Traditional recipe uses Rice Flour and Rava. 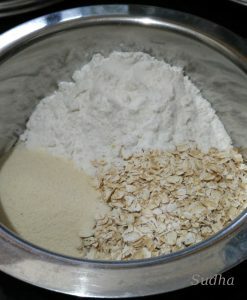 To make it more healthy, I add Oats to it. This is a quick, healthy and tasty dish. 1. 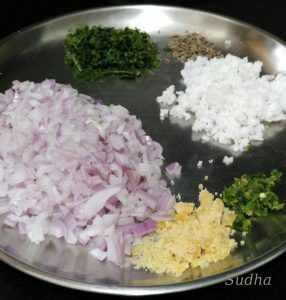 Mix Rice Flour, Oats, Rava, Onion, Chilly paste, Jaggery, Coconut, Coriander, Cumin Seeds and Salt in a bowl. 2. Add buttermilk / Curd / Tamarind Pulp and mix. 3. Add little water (if required) and mix to get a consistency thicker than Bhajia batter / Pan Cake batter. 4. Heat a flat non stick Griddle (Tava). Switch gas to low flame. Sprinkle little water on Griddle to reduce the temperature. Put 2 spoonful of batter on the griddle, take little water in the hand and spread the batter evenly by using the fingers. Thickness should be like Paratha / Pan Cake. Be careful not to touch the hot griddle. 5. Cover it with a lid and cook on medium flame. After 2-3 minutes, remove the lid, put a few drops of oil/ghee on the bhakari and flip it over. The side that you can see will have nice mesh light brown colour design (Jaali). 6. Cook the other side till you get light brown spots on Bhakari. 7. 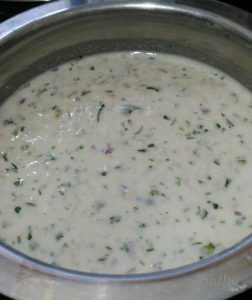 Serve hot with Ghee / Butter and / or any Chutney / Sauce. हा गोव्याचा पारंपारिक पदार्थ आहे. कोंकणीत धिरड्याला भाकरी म्हणतात. ह्या तिखटमिठाच्या असतात किंवा गोडाच्या असतात. ही तिखटमिठाची भाकरी आहे. गोव्याच्या तिखटमिठाच्या भाकऱ्यांमध्ये थोडा गूळ घालतात आणि गोड भाकऱ्यांमध्ये हिरवी मिरची घालतात. त्यामुळे खूप टेस्टी होतात ह्या भाकऱ्या. पारंपारिक कांदा भाकरी मध्ये तांदुळाचं पीठ आणि रवा घालतात. भाकरी आणखी पौष्टिक बनवण्यासाठी मी त्यात ओट्स पण घालते . बघूया तर झटपट होणारी, चविष्ट आणि पौष्टिक कांदा भाकरी कशी बनवतात ते. १. तेल / तूप वगळून सगळे साहित्य एका बाउल मध्ये मिक्स करा. थोडं थोडं पाणी घालून इडली च्या पिठासारखं पीठ भिजवा. ह्या पिठाच्या लगेच भाकऱ्या करू शकता. २. गरम तव्यावर थोडं पाणी शिंपडून २ टेबलस्पूनपीठ घाला. हाताला थोडं पाणी लावून पीठ तव्यावर पसरा – पराठ्यासारखं थोडं जाड. झाकण ठेवून २–३ मिनिटं भाजा. ३. झाकण काढून थोडं तेल/तूप सोडा. भाकरी परतून दुसरी भाजू भाजून घ्या. छान खमंग भाजलेली गरमागरम भाकरी तूप / लोणी / चटणी बरोबर खायला द्या. 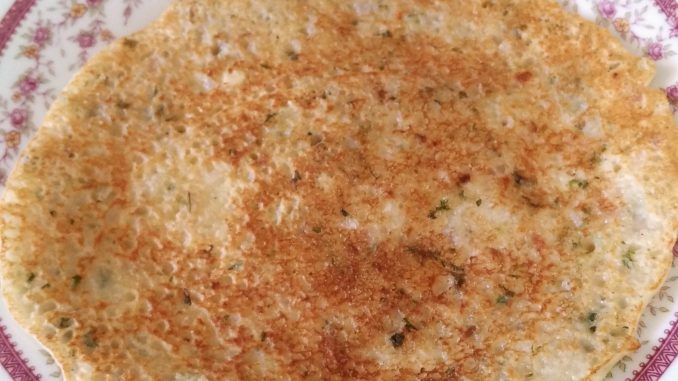 Shilpa tried your dish ‘Kanda Bhakari (Onion Chilla / Onion Pan Cake)’ for breakfast today. Masta taste. We all liked it. Thank you Jitendra & Shilpa for trying my recipe and sharing feedback. Happy to know you all liked it.